GideonTactical, the top-tier source for all things tactical, now offers a versatile tourniquet that effectively negates the risk of exsanguination (bleeding to death) from occurring: the SAM Medical XT Extremity Tourniquet. When dealing with a potentially life-threatening hemorrhage, every second counts. Many times, inappropriately applied tourniquets result in lost lives, with slack in the tourniquet’s strap causing this. SAM Medical, an innovative force in the development of life-saving gear, fully realizes the dangers that are inherent to any challenging mission. This is why their new XT Extremity Tourniquet is specifically designed for those who eagerly confront adversity. 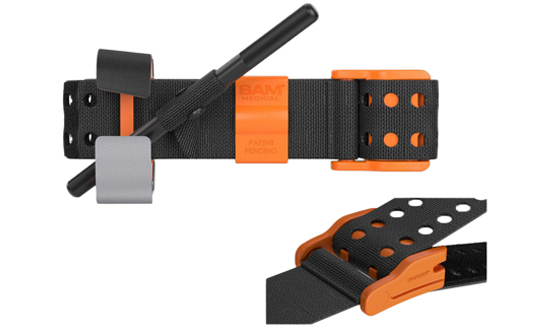 Extremely sturdy, its unique TRUEFORCE™ buckle technology uses baseline-force control to activate locking prongs. This removes nearly all tourniquet slack, thereby preventing exsanguination. The XT Extremity Tourniquet’s innovatively constructed precision tab allows for rapid application: Less windlass turns are required, which enables easier, more streamlined training. Its windlass C-Hooks secure a metal windlass rod thanks to an intuitive, angular design, allowing for easier, more efficient windlass locking. The XT Extremity Tourniquet’s time band features weather-resistant Velcro that provides maximum security in the most inclement-weather conditions. Additionally, the Velcro maintains its adhesion even when fully immersed in liquids, and the outer material is optimized for night-vision use. Its durable nylon construction disseminates force as targeted pressure, thereby offering maximum strength and flexibility. This makes it capable of bending on smaller extremities without breaking. “Bottom line: This is a well-made, tough product that you can count on to work when you need it most,” Brostrom said. Make sure you’re prepared to save a life. Get yours today by visiting GideonTactical.com.